Let us give you a warm welcome. Every Sunday we gather to worship God, to pray from our hearts, and hear God’s word, through expository Christ-centred preaching. The worship service is about an hour long and starts at 10:30am. As our guest just bring yourself. Many people already contribute to the ongoing work of our church so we consider your presence to be your gift to us. If you come prepared to give you can use one of our provided envelopes and we’ll be sure to mail you a charitable donation receipt in the new year. Clothing styles can range from formal to casual and change from season to season. Although slightly dressy isn’t uncommon, don’t miss church just because you couldn’t find your Sunday best. Our worship music includes everything from current praise to the classic hymns. The singing is led by a music team accompanied by electric piano and guitar. All lyrics are projected on the screen and hymnals are available for the hymns. Sunday school for kids (K-7) takes place downstairs after a children’s prayer time upstairs during the service. For your littlest ones we have a supervised nursery downstairs. After every service we have refreshments and social time in the downstairs hall. Be sure to come down to say hello over a cup of coffee, tea, or juice. And we should mention that we often have a pretty good selection of food too. There’s some unpaved parking behind the church (weather permitting) but there’s always parking across the street. There’s also parking on Queen Street, including a designated handicap space in front of the church. The worship service takes place upstairs and we gather for refreshments in the hall downstairs. If you or your guest have any accessibility needs, there is a ground level entrance and wheelchair lift on the southeast corner of the church. One of the two washrooms downstairs is accessible. If there’s anything else you’d like to know beforehand, you can reach us through our Contact page. We would love to hear from you. 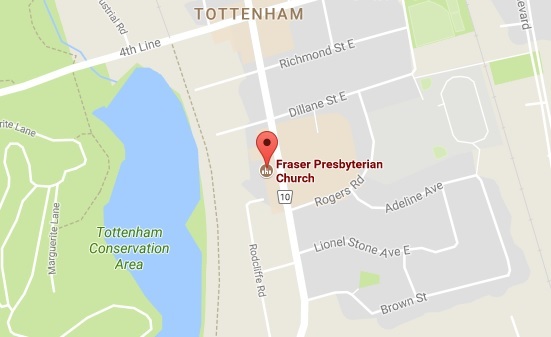 You can find Fraser Church at 70 Queen St. South, across the street from Vince’s Market. We look forward to seeing you. God bless you!